Is this the world’s most expensive April Fools joke? Tesla and SpaceX founder Elon Musk speaks at a press conference following the first launch of a SpaceX Falcon Heavy rocket at the Kennedy Space Center in Cape Canaveral, Fla., Feb. 6, 2018. Tesla shares fell steeply Monday after Musk joked on Twitter that the company was going bankrupt. Maybe April Fools jokes just aren't a good idea for businesses — or the billionaires who run them. 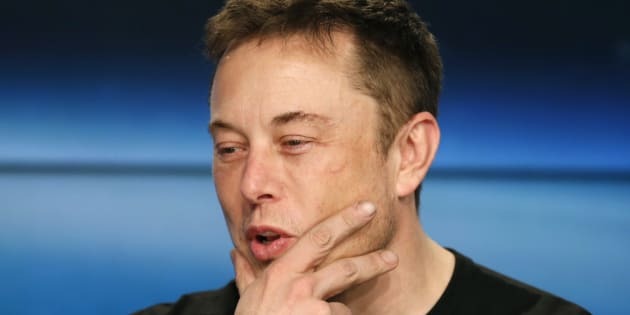 Shares in Elon Musk's electric car company Tesla plunged nearly 7 per cent on Monday morning after some pretty funny — but maybe not very well-thought-out — tweets from the billionaire on Sunday. The company's shares were trading at US$247.59, as of 11 am ET, down 6.97 per cent since open. That after Musk sent out several tweets Sunday declaring that Tesla had gone bankrupt. "So bankrupt, you can't believe it," he tweeted. Musk even sent out a tweet showing himself passed out next to bottles of "Teslaquilla." The joke may prove to be one of history's most expensive: Tesla lost some US$3 billion in value Monday morning. Let's cut to the chase: This joke would have been a lot funnier (and a lot less scary for Tesla investors) if it hadn't come in the midst of a public discussion over whether Tesla is, in fact, at risk of bankruptcy. "Tesla, without any doubt, is on the verge of bankruptcy," ​​​​wrote John Thompson, chief investment officer of Vilas Capital Management, in a note to investors last month, as quoted at Fortune magazine. Thompson predicts that the company's stock will crash in the next three to six months, on falling demand for its Model S and X cars, and delivery problems with the Tesla Model 3. And he's not the only one with jitters about the company. Tesla's stock had already fallen 22 per cent in March, Bloomberg notes, before the April Fools jokes. Credit rating agency Moody's cut Tesla's rating to junk status last week, and said the company may need to find an extra $2 billion to keep operating. That came as the carmaker was hit with bad publicity over a the crash of one of its vehicles in California, which took the driver's life. Tesla said in a blog last week that the car had its Autopilot feature engaged at the time of the crash. Autopilot is a partial self-driving technology, which can do things such as change lanes and park the car. No doubt Musk's joke was meant to be a signal that he isn't worried about Tesla actually going bankrupt, and therefore neither should you be. But today's stock numbers show the joke backfired — and if anything, it has focused even more attention on Tesla's troubles. Look no further than an analysis in USA Today, published Monday, which compares Musk to John DeLorean, the carmaker behind the DeLorean car of "Back to the Future" fame, who famously went bankrupt in the 1980s. Probably not the joke Musk was hoping for.